I got it. I never looked at women’s boxing quite the same after she made that comment. I had (and have, to be honest) only passing interest in it – for several reasons – but I took it seriously from that moment on. And you should consider doing the same. 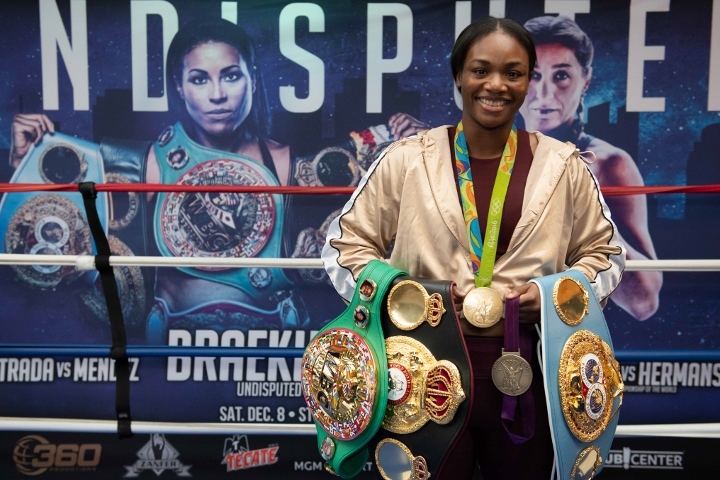 You don’t have to be enthusiastic about Claressa Shields’ middleweight title unification bout against Christina Hammer next Saturday in Atlantic City, on Showtime, but the fighters deserve your respect. It’s their essence, it’s who they are. They train and then fight their hearts out, just like the men do. I’ve always enjoyed women’s boxing, even when I didn’t really know who was fighting. The women often gave the fans the most-exciting fight on the card’s I covered, going back to Rijker’s time. I always had a theory that they tried just a little harder than most men. Why? Because they not only were trying to prove they could win, they were trying to prove that they belonged within the ropes. The problems I’ve had with women’s boxing are a relative lack of a historical foundation and lack of depth of talent. Consider the men’s heavyweight division. Ali led to Holmes and Holmes led to Tyson and Tyson led to Lewis and Lewis led to the Klitschkos and the Klitschkos led to Anthony Joshua, an orderly lineage that adds context and significance to the heavyweight championship fights we watched over the years. The women’s side has had a few stars – Rijker, Christy Martin, Laila Ali – but it has lacked the continuity of the men. For example, Martin, who I admire, didn’t have to beat a series of elite opponents to reach the pinnacle of the sport; promoter Don King simply decided he wanted to create a female star on Tyson undercards and he did. And Martin and King weren’t dodging anyone; there just wasn’t a large pool of top-tier opponents from which to choose. They took what they could get. Now it’s important to note that none of the above was the fault of the women. One, boxing had always been the domain of men. Not many women went into the sport. And, two, when they did decide to box, they didn’t have the same support that the men had. It was a constant uphill battle for them. That has changed, at least to some degree. The introduction of women’s boxing in the Olympics in 2012 sparked fresh interest in the sport and opened some doors. For example, Shields and Cecilia Braekhus have fought in main events on premium cable, which everyone agrees was a breakthrough. Shields vs. Hammer is the feature fight Saturday. The women will tell you, with justification, that there are many out-of-the-ring battles yet to fight. They still don’t have as many opportunities as the men, they don’t make as much money, they still don’t have the same respect. The list goes on. They’re progressing, though. Television executives obviously see something in women’s boxing and they aren’t alone. And the more we watch, the more realize that the women know how to fight. Ruelas had a conservative Mexican upbringing. The thought of women boxing was alien to him, until he met Rijker. Hard for men, harder for women. The women can fight, which should be obvious by now. Rijker demonstrated as much during her sparring sessions with an elite male fighter more than 20 years ago, as well as in her professional fights against women. And active boxers like Braekhus and Shields, among many others, demonstrate it every time they step into the ring. They’re talented, well-trained and passionate, all the things we look for in male fighters. They belong. Michael Rosenthal is the 2018 winner of the Boxing Writers Association of America’s Nat Fleischer Award for excellence in boxing journalism. He has covered boxing in Los Angeles and beyond for almost three decades.